Macular degeneration is also referred to as age-related macular degeneration (ARMD or AMD), due its tendency to affect older adults. There are different types of macular degeneration, and depending on the type and severity, vision loss can be minimal or it can cause blindness. This disease affects the macula, the central part of the retina that allows you to see straight ahead and in fine detail. The macula is the most sensitive part of the retina. By the age of 65, the macula begins to degenerate or deteriorate in one out of every four people, and in one out of every three people over the age of 80. In most cases the disease affects both eyes, although it can be more advanced in one eye than the other. What Are The Various Types of Macular Degeneration? Wet macular degeneration accounts for only 10 percent of all cases, and occurs when tiny abnormal blood vessels begin growing behind the retina, toward the macula. These abnormal blood vessels leak blood and fluid, damaging the macula and causing severe and rapid vision loss. 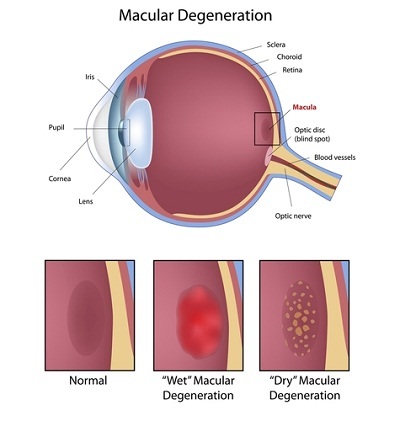 Wet macular degeneration is much more severe than the dry form. Symptoms of dry macular degeneration include blurry vision and a small blind spot in the central field of vision. As time passes, the small blind spot grows larger and affects vision more, making it harder to read fine print or see details. Symptoms of wet macular degeneration include distorted shapes, blurry vision, and an enlarged blind spot in the central field of vision. The distortion is caused by leaky blood vessels under the macula. When Should I See My Doctor About Macular Degeneration? To diagnose macular degeneration, a complete eye examination with dilation is necessary. Occasionally, fluorescein angiography may be performed, especially if wet degeneration is suspected. During this procedure, flourescein dye is injected into a vein in the patient’s hand or arm, and photographs of your retina are taken as the dye circulates. A visual acuity test and an amsler grid test will help determine whether any central vision has been lost or any distortion of vision is present. During the Amsler grid test, patients cover one eye and focus on a black dot that is surrounded by a pattern of straight lines. If these lines appear wavy or are missing, it indicates a problem within the macula, and possible macular degeneration. Is There A Way to Treat Macular Degeneration? Taking a high-dose formulation of certain antioxidants and zinc slows the progression of macular degeneration. According to the research done by the NEI, “The specific daily amounts of antioxidants and zinc used by the study researchers were 500 milligrams of vitamin C, 400 International Units of vitamin E, 15 milligrams of beta-carotene (often labeled as equivalent to 25,000 International Units of vitamin A), 80 milligrams of zinc as zinc oxide, and two milligrams of copper as cupric oxide. Copper was added to the AREDS formulation containing zinc to prevent copper deficiency anemia, a condition associated with high levels of zinc intake.” This high level of antioxidants is virtually impossible to achieve with diet or daily doses of multi-vitamins. Vitamins with the appropriate levels of nutrients will be labeled with the letters AREDS to indicate that they follow the NEI research recommendations. In the past, wet macular degeneration was treated with laser surgery to destroy the abnomal blood vessels. This process can cause more vision loss, as it damages nearby tissue. Treatment for wet macular degeneration has significantly advanced in recent years. New medicines have been developed to slow or reverse the growth of the abnormal blood vessels. These new medicines, called anti-angiogenic or anti-vascular endothelial growth factor drugs, are administered as injections and have been known to improve vision loss. The two most common are Avastin and Lucentis. The medicine is injected into the eyeball and takes effect immediately. Injections are typically repeated every month or two until the treatment is complete. In January of 2010, new clinical studies were conducted on a number of patients with age-related dry macular degeneration. Acucela (the company founded by Ryo Kubota, MD, PhD, the discoverer of a gene that causes glaucoma) believes they have found a new oral drug that is effective in treating the dry form of AMD. This breakthough study shows the oral therapy drug targets cells within the retina to protect visual acuity. In March of 2010, Acucela received the Fast Track designation from the FDA for ACU-4429 (the current name for the drug) for the treatment of dry AMD. This new drug is said to be a great alternative to the injections that are currently being used to treat more advanced stages of macular degeneration. Another study published on April 28, 2011 shows promise in the use of gene therapy against AMD. Conducted by researchers at Tufts University School of Medicine, the study showed for the first time that CD59 (a protein used in gene therapy) delivered by a gene therapy approach significantly reduced the uncontrolled blood vessel growth and cell death that accompany macular degeneration. 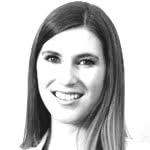 Siobhan Cashman, PhD, is the assistant professor in the department of ophthalmology at Tufts University School of Medicine. He states, “treatment was effective when administered at a very specific location beneath the retina, but importantly, also when it was administered to the center of the eye. This finding is especially encouraging because it would allow for a safer and more convenient route of administration of treatment.” The study’s conclusion suggests that CD59 may be useful in treating dry and wet forms of macular degeneration. Can I Prevent Macular Degeneration From Developing? Prevention of macular degeneration includes reducing UV exposure and eating a healthy diet containing plenty of antioxidants and zinc. Eating foods rich in Vitamins A, C, and E may also help reduce your chances of developing this disease. A study conducted by the National Eye Institute suggests that lutein and zeaxanthin (nutrients found in eggs and green vegetables) may also be protective against the disease. Exercising and staying healthy are always a good way to prevent all diseases. For more information on nutrition and eye care visit our eye care nutrition pages. What Are The Complications of Macular Degeneration? Macular degeneration can cause varying degrees of vision loss, and it is the leading cause of legal blindness in the aging population in America. Some people diagnosed with this disease are able to maintain a normal lifestyle and require no significant treatment. Untreated or advanced macular degeneration can lead to severe vision loss or even blindness. Complications can arise from the various forms of treatment for macular degeneration. For example, injections into the eyeball can be painful and carry a small risk of infection, bleeding, and retinal detachment. Always consult with your doctor about the benefits and risks involved with treatment. If my grandma has macular degeneration, how likely is it that I will develop it? How often should I schedule appointments to see you?